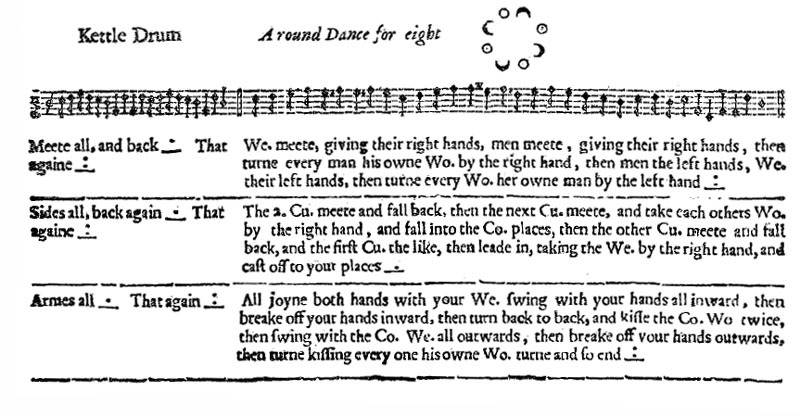 The movements to the A musics are the standard Up a Double, Siding and Arming of many 1651 dances. Mabel wrote her version around 1940 so she probably intended Left Shoulder Swirly Siding both times; these days Into Line Siding, Right Shoulder then Left Shoulder, would probably be more likely. Mabel Clayden's version from English Dance & Song is at the bottom of this page. These versions are all shown below, figure by figure, for easy comparison. Dancing Masters use words to mean what they want them to mean. The dances were almost certainly provided by different Dancing Masters so you can't assume knowledge of one dance can be used in another dance. Playford's proof reading was not great. Just look at the page numbering to see that errors abound. So what is the chance of detailed techincal data being accurate? The dots and lines at the end of phrases are supposed to indicate the length of the music, but I can see different numbers of dots in different scans (different editions? dirty marks?). Punctuation is random so you can't rely on it. There is no indication of how many beats are used for each part of the figure. Words like "inward" and "outwards" don't appear in any other dances so there are no other clues as to what they might mean. Dafydd also points out that, as a general rule which holds true for around 90% of Playford's dances, you never cross a phrase with a single piece of choreography. In other words, the music is not there just to provide a beat; it delineates and separates the steps you are doing. So let's look at the various interpretations figure by figure. "We. meet, giving their right hands, men meet, giving their right hands, then turn every man his own We. by the right hand, then men the left hands, We. their left hands, then turn every We. her own man by the left hand." I am not quite sure what the timing is here, for instance how long is allowed for stepping in and out, and whether the men step in as the ladies step out, but it seems to me it will take at least three B musics. And that is the easy figure! "The 2. Cu. meet and fall back, then the next Cu. meet , and take each others We. by the right hand, and fall into the Co. places, then the other Cu. meet and fall back, and the first Cu. the like, then lead in, taking the We. by the right hand, and cast off to your places." "Cu." could mean "Couple" or "Couples". "2.Cu" could mean "the second couple" or "the two couples" (i.e. Heads as many dances start with the Heads), or "the second couples" (i.e. Sides, Heads being the first couples). Most of the phrases in this section are in the plural so I believe that "Cu" means "Couples" and "2.Cu" means Heads. "Co." is short for "Contrary" and is used to mean Neighbour in a Duple Minor, so it could be interpreted as Corner. But I believe that it is more likely to mean Opposite as in Newcastle. After the Gate half of the dancers are facing out so need to turn towards each other to face in. Cécile's Notes: The second part is difficult to fit into just 8 bars with a coherent whole. The solution I put forward takes some of the elements into account but there may be other ways. It starts with the second couple and ends with the first couple, both mentioned. I chose to interpret "the next couple" coming to face the second as the third. When the movement is repeated, the "other couple" is then the fourth couple, starting before the first couple and dancing with them. My choice of interpretation was called for by the mention of casting at the end. 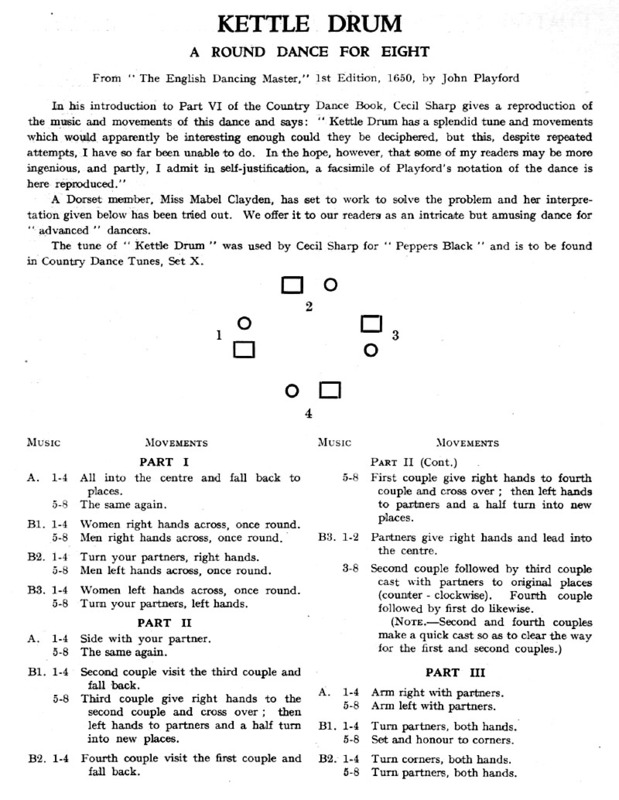 In my version, opposite dancers cross by the right shoulder, no hands; each couple goes through the other one’s place and comes back to its own with a double cast. It is possible to do that with just two B musics if the Sides start their approach as the Heads fall back, but it is a bit rushed. Isn't it amazing that so few words can be interpreted in so many different ways! "All joyn both hands with your We. swing with your hands all inward, then breake off your hands inward, then turn back to back, and kisse the Co. Wo twice , then swing with the Co. We. all outwards , then break off your hands outwards, then turn kissing every one his own Wo. turn and so end." Hmmm... what happened to the kissing? This seems like a good interpretation of what is happening with the hands, but I find there is too much time, it all seems to be happening in slow motion. I am not sure what the timing is here. The men's single file promenade can be a men's Circle Left if the ladies get close together in the middle. So choose whichever version of each figure you like best and put them together to make the dance!